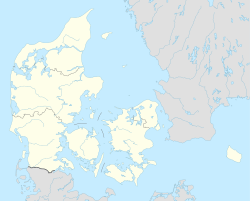 Birkerød (Danish: [ˈbiɐ̯ɡəʁøːˀð]) is a town in Rudersdal Municipality in the northern outskirts of Copenhagen, Denmark. It is surrounded by several lakes and small woodlands. Birkerød station is located on the Hillerød radial of the S-train network. The parish of Birkerød was home to the villages Birkerød, Kajerød, Bistrup, Ravnsnæs, Isterød, Høsterkøb, Sandbjerg and Ubberød. Birkerød became a railway town in 1868, when the Nordbanen railway opened a trainstation here between Lyngby and Helsingør. This led to new growth and several brickyards opened in the area in the second half of the 19th century. The rail line between Copenhagen and Hillerød was later converted to an S-train line and construction of new residential neighbourhoods accelerated in the 1940s which, in time, made Birkerød merge with Bistrup to the south, Kajerød to the west and Ravnsnæs to the east. Birkerød is bordered by 941-hectare Lake Furesø to the south and Lake Sjælsø to the north. The smaller Birkerød Lake is located just south of the railway station in the town centre. The approximately 86 hectares wetland Vaserne (in Danish) along the northeastern shores of Lake Furesø and the western part of Frederikslund Forest separates Birkerød (Bistrup) from Holte to the southeast. Bistrup Hegn is situated between Bistrup to the south and Birkerød to the north. Rude Forest is located to the east of Virkerød. Eskemose Forest at Lake Sjælsø, north of Kajerød, is the site of several natural springs. Birkerød consists mainly of single family detached homes. Tegnestuen Vandkunsten has designed a number of housing estates. Trudeslund (1980-81) is a cohousing community. The concept was later developed further with Jystrup Savværk in Jystrup. The Langkjærgård development is from 1985 and Blikfanget was built in 1988-1989. Søhuse (1995), a development of terraced housing, is located on a gently sloping site on the banks of Birkerød Lake. Mantziusgården, the former state school, is now used as a local cultural centre. Activities include art exhibitions, concerts, theatre and stand-up. The premises also comprise four open workshops with facilities for making graphic art, glass art, ceramics and weaving. Other cultural Institutions includes Birkerød Library and the Local Historic Archives. The local football club of IF Skjold Birkerød was founded in 1917, and currently plays the Danish 2nd Division East. Furesø Golf Club is based at Hestkøbgård in the western part of Birkerød. The club was established in 1974. Birkerød Gymnasium was founded as a private boys' school in 1868. It is now a public upper secondary school with approximately 1,000 students. It includes a boarding school section with some 100 students. In 2011, a Model UN at Birkerød Gymnasium, attracted several hundreds of high-school students from around Europe, and continues to do so every year. Birkerød Church is a traditional Danish parish church whose oldest parts date from the late 12th and early 13th century. The tower was built in the late 15th century, the current chancel in about 1500 and the porch in 1525. The Parish of Bistrup was disjoined from that of Birkerød in 1963 and its church was inaugurated in 1967. The property Nordvanggård housed a congregation of Sisters of the Precious Blood from the late 1950s until 2015. The Sisters belong to the German Province, the provincial house is in Neuenbeken near Paderborn. They also have a convent in Rønne on the island of Bornholm. The building is now owned by Rudersdal Municipality and is temporarily used to house refugees. Birkerød station is located on the Hillerød radial of the S-train network. The stations is served by the E trains on weekdays and B trains on weekends. Lyngby Kongevej bisects Birkerød on its way from Copenhagen to Hillerød. The Hillerød Motorway passed Birkerød to the west and the Helsingør Motorway passes Birkerød to the east. Erling Brøndum (1930 – 2017 in Birkerød) a Danish journalist and politician, Defence Minister of Denmark from 1973 to 1975. ^ "Global Medical Aid". Archived from the original on 2013-12-13. ^ a b "Birkerød" (in Danish). Rudersdal Kommune. Archived from the original on 20 April 2013. Retrieved 5 December 2015. ^ "Trudeslund". arkitekturbilleder.dk (in Danish). Archived from the original on 8 December 2015. Retrieved 5 December 2015. ^ "Blikfanget, Birkerød". arkark.dk (in Danish). Langkjærgård. Retrieved 5 December 2015. ^ "Blikfanget, Birkerød". arkark.dk (in Danish). Retrieved 5 December 2015. ^ "Søhuse". arkitekturbilleder.dk (in Danish). Archived from the original on 8 December 2015. Retrieved 5 December 2015. ^ "Kulturhus Mantziusgården" (in Danish). Rudersdal Kommune. Archived from the original on 14 November 2009. Retrieved 5 December 2015. ^ "Birkerød Sports and Leisure Centre". Archtonic. Retrieved 5 December 2015. ^ "BIGMUN Official Website". Archived from the original on 2013-05-17. ^ "Birkerød Kirke" (in Danish). Nordens Kirker. Retrieved 5 December 2015. ^ "About us". The Sisters of the Precious Blood. Retrieved 5 December 2015. Wikimedia Commons has media related to Birkerød. This page was last edited on 3 August 2018, at 20:32 (UTC).